Passengers wringing their hands over delayed flights and lost baggage aren't the only problem plaguing airlines. A near collision on the tarmac at Dallas-Fort Worth airport on April 6 punctuated a six-month period that included 15 other runway "incursions"  a spike from eight during the same period the year before. With air traffic controllers having operated for more than 600 days without a new contract from the FAA, morale among them is at an all-time low, and with just 11,100 fully trained professionals serving the entire country  the smallest number in 16 years  a combination of fatigue and frustration is laying a dangerous groundwork. Doug Church, union spokesman for the National Air Traffic Controllers Association, says the practitioners of this unsung profession are being hung out to dry. "We're left trying to hold the system together like MacGyver  with duct tape and scissors and string." TIME caught up with air traffic controller Melvin S. Davis, a 22-year veteran and the facility representative for Terminal Radar Approach Control for Southern California, which serves airports in Los Angeles, Burbank, Ontario, Orange County, Palm Springs and San Diego. TIME: Air traffic controllers are frequently ranked as among the most stressful of jobs. Why? Melvin S. Davis: There are intense amounts of stress in short bursts. Studies can link the fact that we  myself being one of them  die much younger than our counterparts. And that comes back to stress and the impact it has on the body. My daily routine is dealing with aircrafts that have anywhere between two and four hundred people on board, and that are traveling at about 600 miles an hour. They all have an objective  to get the airplane on the ground as quickly as possible. And I have to be the traffic cop. In the high-density terminal environment, there's one individual who has to pull it all together, and that's me. What are the inherent difficulties in pulling together that process? One of our Achilles' heels is a very antiquated communications system. We use 1950s technology to communicate in a 2010 environment. The frustrating thing is, there are incredible technologies available for communicating  via data-link or digital voice radio systems  and I've seen people die because we haven't implemented those technologies. Is cost the reason why? It's more politics than it is cost. The FAA is a rule-making agency. When you've got to do rule-making, politics get involved, and then it's hard to decide which equipment, whose company gets mandated, etc. And it's not necessarily just the lawmakers that complicate the process, but all the stakeholders: the airlines, general aviation, corporate aviation and then the government's air traffic control. To do nothing is a lot easier. How does communication with planes work? It's really fairly simple. We're using a CB radio with a little bit higher power. If you fast-forward to the way we communicate over cell phones or the Internet, or data-link technology, all those technologies are available, and we're not using them. We're stuck in the CB radio, Smokey Bear days. How much of a hindrance is using outdated technology? We had a labor dispute a couple of years ago that has now transitioned into a safety issue. The FAA had a mandate from Congress to start running things like a business, to be more cost-effective. That has manifested itself in the rise of runway incursions [airplanes invading each other's ground space]. These are very clearly the result of a reduction in staffing, a decline in experience, and an increase in the use of employee overtime, which leads to increased fatigue. The result is a 300% to 400% increase in operational errors. Listen, this is a great job and I will retire happy. This is not about work rules. It's about the guys I see walking by my office with black circles under their eyes on their third cup of coffee. And they're making mistakes, which results in two bullet trains coming together at 600 miles an hour from opposite directions. How could the safety situation be improved? I strive for perfection, but I'm human. The way to fix that is to provide oversight and redundancy. There are two pilots in the cockpit of every commercial aircraft. If one of them has a heart attack or makes a mistake, the other one is there to fix it. What's happened over the last few years is to save money, they've engineered out oversight of the human element. It's too expensive to have that second team sitting and watching the first team. So the bottom line is that one of the prescriptions for improving safety is hiring and retaining high-quality individuals in the places where we have the greatest amount of risk. But that's too expensive. And so we have a rise in operational errors. It's a business decision. And what could be the consequences? I can tell you. In 1991 there was a horrible accident in LA, we  being air traffic controllers  cleared one airplane to land on an occupied runway. We killed 34 people. I was there the next morning, I knew the person that did it. I saw her go out on stress leave. I saw the body bags come out of the airplane, and I can tell you, I've got that sinking feeling in my stomach right now that we're just another day away from another one of those situations. It's going to break my heart, because we've been telling everyone to listen. We've been very careful not to be Chicken Little, but we're at the point of critical mass. 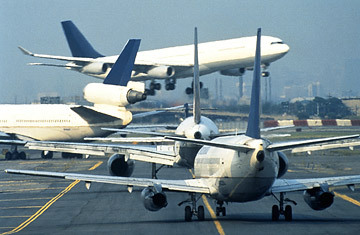 Do you think the public understands challenges facing air traffic controllers? I would say that we've been treated fairly well in the media and in public perception. When I introduce myself and say what I do, overwhelmingly people say, "Wow, you guys are doing a great job. Hang in there, we're pulling for you."